IRA Account: a Viable Option? The tax return filing season is right around the corner and with it comes the question of whether opening an IRA account is a good idea. Opening an IRA Account is worthy because you could obtain several tax exemptions depending on the IRA account you chose at the same time you are saving for retirement. If you save, you will have enough money to fulfill your economic obligations and face those unexpected situations that may arise, such as a prolonged illness, among others. That is why if you want to live your retirement with peace of mind, you must make important decisions today. Remember that an IRA account is a vehicle for retirement. Even without adding the interest that it will accumulate to the equation, a simple mathematic exercise will prove to you the importance of start saving as soon as possible. If you save $100 monthly for 20 years you will have $24,000. If that seems difficult, try saving $50. You can put up to $5,000 annually on an IRA account. Saving that kind of money gives amazing results. In 20 years you could have saved $100,000. The next graphic will help you get a clearer picture of what you can expect to obtain. What can I do if I don’t have the money now? 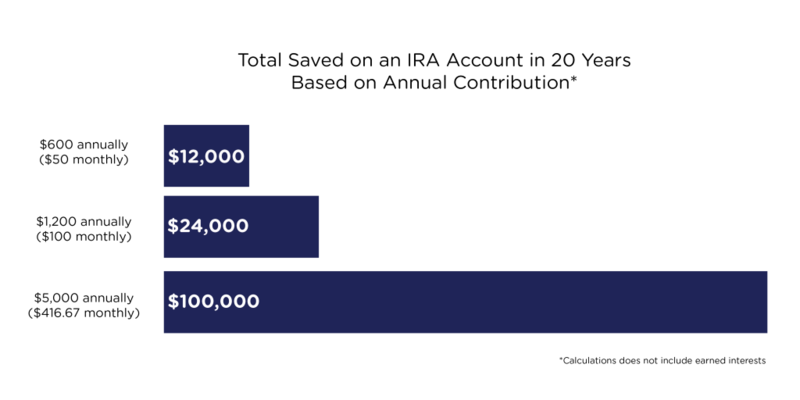 Some may argue that it’s really hard to save $5,000 or even $10,000 annually to deposit into an IRA account. Some may even argue that it may be difficult to bring the initial minimum amount required for the IRA account opening. A remedy for this situation could be to open an account that will allow you to deposit with the same frequency as you receive your income. For example, if you get your paycheck weekly, then you should be able to deposit an amount each week, which will in turn be deposited into an IRA account each April. Notwithstanding before you open an IRA, we recommend that you evaluate among the IRA accounts available, the minimum initial deposit required to open each of them and their respective characteristics. This way you could chose the one you can afford to at the moment of the account opening and the best IRA that fits your expected return when you reach the retirement. On the other side, if you have a genuine emergency that merits a withdrawal of funds, you will have money available. But be advised that the IRA accounts have restrictions so you won’t be able to spend the money so easily. Don’t refrain to have the opportunity to invest in you. Start saving this year with any amount that you can and try to increase it for next year. For more information about this and other financial tips, visit popular.com/en/finances. *Banco Popular offers various investment alternatives. You should obtain detailed information to determine which is best suited to your needs.